Just so pleased to be working again with the ever-inventive Oversteps poet Rebecca Bilkau and Beautiful Dragons Press. This time we’re a nebulous constellation of poets writing about Heavenly Bodies. 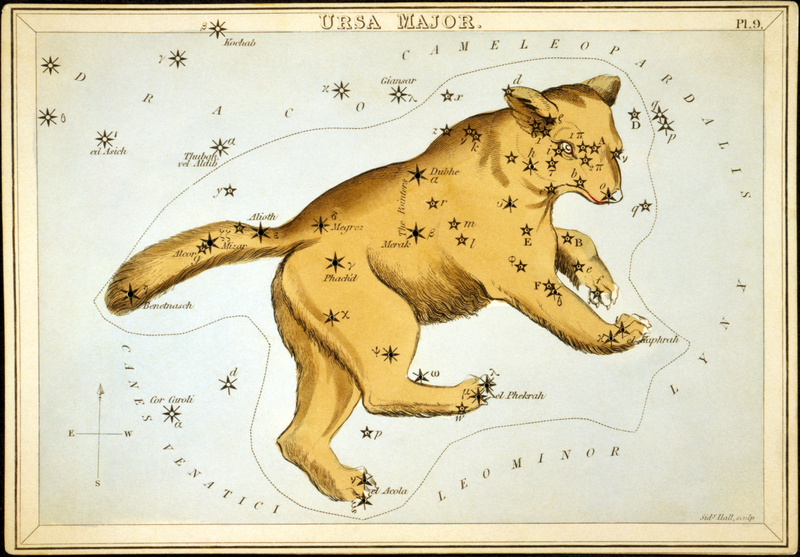 I have chosen to write about Ursa Major. Mostly because I knew I could actually identify it from the back garden. The Plough forms part of the Bear, and has been my stellar lodestone from childhood. Also known to our family as The Saucepan. And it points to North. The constellation has been seen as a bear by many different cultures, with a mythology which may extend back for 13,000 years. Some of the earliest stories suggest a hunt, in which the bear is pursued alive into the sky, where it becomes stars. Because Ursa Major is visible throughout the year, it has been a touchstone for wayfinding through long millenniums of nights. There are beautiful and old depictions of the constellation’s stars, and the Bear they form. I’m enormously enjoying researching for this poem. And when I’m walking back up the garden from shutting up the hens for the night, I can look up at Ursa Major, winking steadily above the slates. Jean Atkin January 4, 2014 November 2, 2014 Beautiful Dragons Press, Heavenly Bodies, Oversteps Books, Rebecca Bilkau.